It's not romantic, but then romance and love are not the same thing. 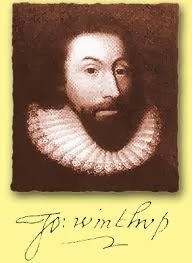 In the spring of 1618, John Winthrop, who would be governor or deputy governor of Massachusetts Bay Colony for most of the years between 1630 and his death in 1649, was a two-time widower. He had four living children by his first wife Mary Forth, who died. About five months later, in December 1615, he married Thomasine Clopton, but she died a year later, after giving birth to their first baby. 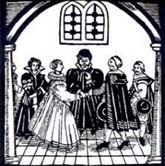 John then became engaged to Margaret Tyndal, the daughter of a knight. They would marry, have children (four lived to adulthood), and she would die of fever in 1647. Margaret was the model Puritan wife who honored, obeyed, and deferred to her husband in all things. By all accounts, including Margaret herself, she was loved, honored and cherished by her husband and children, and her step-children. The letter I’ve chosen to reproduce below with a minimum of editing (removing symbols left by the scanning of old books) is one that 30-year-old John Winthrop wrote to 17-year-old Margaret Tyndal, 25 days before their April 29, 1618 wedding. 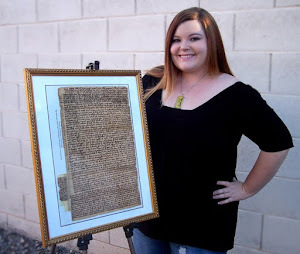 The letter is very long, and as a postscript, Winthrop explains that if he’d known he’d write half that much, he’d have chosen larger paper. He used many scripture references to teach his soon-to-be bride her role as a proper wife, and how their marriage was to reflect the relationship of Christ and his church. 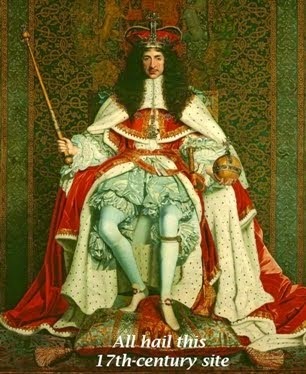 In my research of the 17th century, I haven’t found any Bridezillas. Anglicans favored church weddings that started at the church door with the service from the Book of Common Prayer, and then processed to the chancel rail for Communion. Puritans disdained the BCP and its resemblance to the Catholic liturgy; they also did not consider marriage one of the sacraments. So Puritans often married in a civil service in a home or tavern, which was conducted by a secular magistrate and then blessed by a minister’s prayer. Both Anglicans and Puritans held feasts and celebrated traditions, drank and danced. Yet John Winthrop felt it necessary to warn Margaret about “trifles” of “apparell, fashions & other circumstances” and savoring the fleshly delights of the world. As a knight’s daughter and future wife of a lawyer, she was required to honor her men with dressing to a certain standard neither too high nor too low. Even the height of a woman’s heels was prescribed for her class. In other words, if Winthrop’s kept happy, Margaret will be happy. Then Winthrop urged his “sweet love” not to be upset about his requests and to be a good sport, saying that he was not requiring more of her than he would of himself. It appears from subsequent letters and what Winthrop wrote in his public journal that he and Margaret had a loving, trusting marriage which lasted for 29 years. The 17-year-old bride became a stepmother to his first four children, and they seemed to love her as their own mother. In 1647, six months after Margaret died, he remarried for a fourth time, to Martha Rainsborough. JOHN WINTHROP TO MARGARET TYNDAL. To my best beloved Mistress Margaret Tyndall at Great Maplested, Essex. My onely beloved Spouse, my most sweet freind, & faithfull companion of my pilgrimage, the happye & hopefull supplie (next Christ Jesus) of my greatest losses, I wishe thee a most plentifull increase of all true comfort in the love of Christ, with a large & prosperous addition of whatsoever happynesse the sweet estate of holy wedlocke, in the kindest societye of a lovinge husbande, may afford thee. Beinge filled with the joye of thy love, & wantinge opportunitye of more familiar comunion with thee, wch my heart fervently desires, I am constrained to ease the burthen of my minde by this poore helpe of my scriblinge penne, beinge sufficiently assured that, although my presence is that which thou desirest, yet in the want thereof, these lines shall not be unfruitfull of comfort unto thee. And now, my sweet Love, lett me a whyle solace my selfe in the remembrance of our love, of which this springe tyme of or acquaintance can putt forthe as yet no more but the leaves & blossomes, whilest the fruit lyes wrapped up in the tender budde of hope; a little more patience will disclose this good fruit, & bringe it to some maturitye: let it be our care & labour to preserve these hopefull budds from the beasts of the fielde, & from frosts & other injuryes of the ayre, least our fruit fall off ere it be ripe, or lose aught in the beautye & pleasantnesse of it: Lett us pluck up suche nettles & thornes as would defraud of plants of their due nourishment; let us pruine off superfluous branches; let us not sticke at some labour in wateringe & manuringe them : — the plentye & goodnesse of fruit shall recompense us abundantly: Our trees are planted in a fruitfull soyle; the grounde, & patterne of our love, is no other but that betweene Christe & his deare spouse, of whom she speakes as she finds him, My welbeloved is mine & I am his: Love was their banquetting house, love was their wine, love was their ensigne; love was his invitinges, love was her fayntinges; love was his apples, love was her comforts; love was his embracinges, love was her refreshinge: love made him see her, love made her seeke him: love made him wedde her, love made her followe him: love made him her saviour, love makes her his servant. Love bredd or fellowshippe, let love continue it, & love shall increase it untill deathe dissolve it. The prime fruit of the Spirit is love; truethe of Spirit true love: abounde with the spirit, & abounde with love: continue in the spirit & continue in love: Christ in his love so fill our hearts with holy hunger & true appetite, to eate & drinke with him & of him in this his sweet Love feast [referring to the sacrament of the Holy Communion, which it was then the custom to administer to the bride and bridegroom at their marriage], which we are now preparinge unto, that when our love feast shall come, Christ Jesus himselfe may come in unto us, & suppe with us, & we with him: so shall we be merrye indeed. (O my sweet Spouse) can we esteeme eache others love, as worthy the recompence of our best mutuall affections, & can we not discerne so muche of Christs exceedinge & undeserved love, as may cheerfully allure us to love him above all? He loved us & gave himselfe for us; & to helpe the weaknesse of the eyes & hande & mouthe of or faithe, which must seeke him in heaven where he is, he offers himselfe to the eyes, hands & mouthe of our bodye, heere on earthe where he once was. The Lord increase our faithe. Nowe my deare heart let me parlye a little with thee about trifles, for when I am present with thee my speeche is prejudiced by thy presence, which drawes my minde from it selfe: I suppose nowe, upon thy unkle's cominge, there wilbe advisinge & counsellinge of all hands; & amongst many I knowe there wilbe some, that wilbe provokinge thee, in these indifferent things, as matter of apparell, fashions & other circumstances, rather to give contente to their vaine minds savouringe too muche of the fleshe &c, than to be guided by the rule of Gods worde, which must be the light & the Rule; for allthoughe I doe easyly grant that the Kingdome of heaven is not meat & drinke, apparell &c, but Righteousnesse, peace &c: it beinge forbidden to fashion ourselves like unto this world, & to avoyde not only evill but all appearance of it must be avoyded, & allso whatsoever may breed offence to the weake (for which I praye thee reade for thy direction the [epistle] to the Rom:) & for that Christians are rather to seeke to edifie than to please, I hold it a rule of Christian wisdome in all these things to followe the soberest examples: I confesse that there be some ornaments which for Virgins & Knights daughters, &c, may be comly & tollerable, which yet in so great a change as thine is, may well admitt a change also: I will medle with no particulars, neither doe I thinke it shalbe needfull; thine owne wisdome & godlinesse shall teache thee sufficiently what to doe in suche things: & the good assurance which I have of thy unfained love towards me, makes me perswaded that thou wilt have care of my contentment, seeing it must be a cheife staye to thy comfort: & withall the great & sincere desire which I have that there might be no discouragement to daunt the edge of my affections, whyle they are truly labouring to settle & repose themselves in thee, makes me thus watchfull & jealous of the least occasion that Satan might stirre up to or discomfort. He that is faithfull in the least wilbe faithfull in the greatest, but I am too fearfull I doe thee wronge, I knowe thou wilt not grieve me for trifles. Let me intreat thee (my sweet Love) to take all in good parte, for it is all of my love to thee, & in my love I shall requite thee: I acknowledge, indeed, thou maist justly say to me as Christ to the Pharisies, Hypocrite, first cast out the beame that is in thine owne eye &c, for whatsoever I may be in thy opinion, yet mine owne guiltie heart tells me of farre greater things to be reformed in my selfe, & yet I feare there is muche more than in mine owne partiall judgment I can discerne; iust cause I have to complaine of my pride, unbeleefe, hardnesse of heart & impenitencie, vanitye of minde, unrulinesse of my affections, stubbornesse of my will, ingratitude, & unfaithfullnesse in the Covenant of my God, &c. therefore (by Gods assistance) I will endeavour that in myselfe, which I will allso desire in thee. Let us search & trye or hearts & turne to the Lord: for this is our safetye, not our owne innocencye, but his mercie: If when we were enemies he loved us to reconciliation; much more, beinge reconciled will he save us from destruction. Lastly for my farewell (for thou seest my lothenesse to parte with thee makes me to be teadious) take courage unto thee, & cheare up thy heart in the Lorde, for thou knowest that Christ thy best husbande can never faile thee: he never dies, so as there can be no greife at partinge; he never changes, so as once beloved & ever the same: his abilitye is ever infinite, so as the dowrye & inheritance of his sonnes & daughters can never be diminished. As for me a poore worme, dust & ashes, a man full of infirmityes, subiect to all sinnes, changes & chances, wch befall the sonnes of men, how should I promise thee any thinge of my selfe, or if I should, what credence couldst thou give thereto, seeinge God only is true & every man a lyar. Yet so farre as a man may presume upon some experience, I may tell thee, that my hope is, that suche comfort as thou hast allreadye conceived of my love towards thee, shall (throughe Gods blessinge) be happily continued; his grace shalbe sufficient for me, & his power shalbe made perfect in my greatest weaknesse: onely let thy godly, kinde, & sweet carriage towards me, be as fuell to the fire, to minister a constant supplie of meet matter to the confirminge & quickninge of my dull affections: This is one ende why I write so muche unto thee, that if there should be any decaye in kindnesse &c, throughe my default & slacknesse heerafter, thou mightest have some patternes of or first love by thee, to helpe the recoverye of suche diseases: yet let or trust be wholly in God, & let fis constantlye followe him by or prayers, complaininge & moaninge unto him or owne povertye, imperfections & unworthynesse, untill his fatherly affection breake forthe upon us, & he speake kindly to the hearts of his poore servant & handmayd, for the full assurance of Grace & peace through Christ Jesus, to whom I nowe leave thee (my sweet Spouse & onely beloved). Groton where I wish thee. Aprill 4. 1618. My father & mother salute thee heartyly with my Lady & the rest. If I had thought my lettre would have runne to halfe this lengthe I would have mayde choyce of a larger paper. 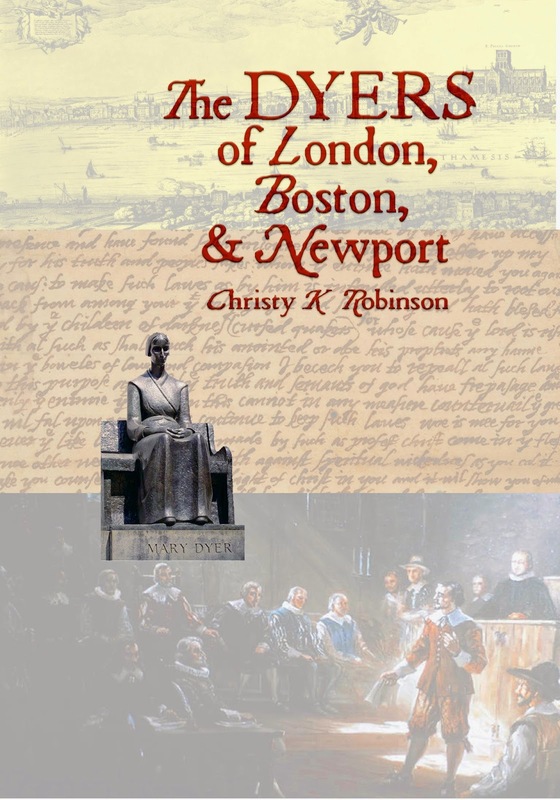 The Dyers of London, Boston, & Newport, by Christy K Robinson. Nonfiction, illustrated. 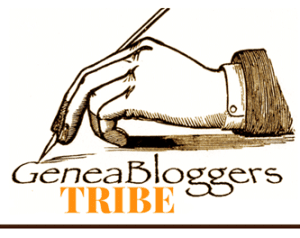 The research and recent discoveries behind the novels. 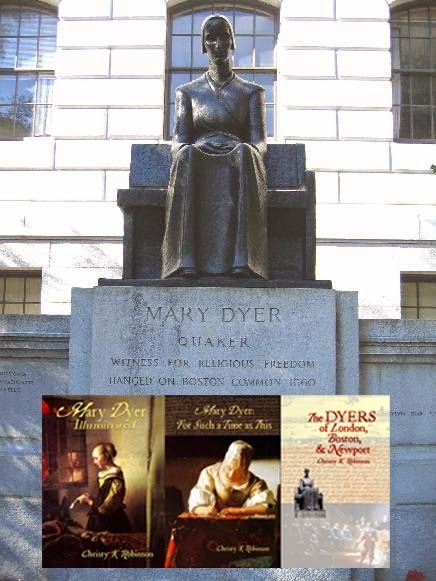 The Dyers is a lively nonfiction account of background color, culture, short stories, personality sketches, food, medicine, interests, recreation, cosmic events, and all the "stuff" that made up the world of William and Mary Dyer in the 1600s. Chapters on John Winthrop, Roger Williams, Anne Hutchinson, John Endecott, and many others. More than 70 chapters, and all-new, exclusive content found nowhere else! This is fascinating, especially as I have conflicts between Puritans and Anglicans in my new novel, FLOOD, and even a wedding! Not only physical conflicts but conflicts in their whole attitude to life. Although it is much more affectionate, this letter does remind me of Casaubon's 'love letter' to Dorothea in Middlemarch. The same male patronising condescension towards a young bride, and the same emphasis on the woman's duty to make the man happy. I've always thought George Eliot's Casaubon letter is one of the most brilliant exposures of a character in literature. From Winthrop's letter, one can't help feeling he would have been a very difficult man to live with! John Winthrop was a complicated man, and he was a major character in my novel, Mary Dyer Illuminated. I think I figured him out, which would have infuriated him! To prepare to write my book, I studied his public journal over and over, and read his personal, spiritual journal called Experiencia, as well as his letters to Margaret and many others. In a nutshell (always a dangerous assumption), he was never happier than when suffering for the Lord. 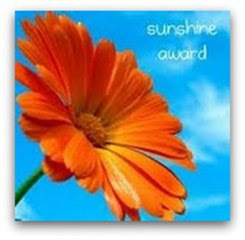 And when he enjoyed success in his career or family life--or even the weather on a July day--he would suddenly awaken and take that as pride in his own accomplishments instead of a gift of grace. He believed that the good life distracted him from God. Then he would fast (or take only a small ration of bread) and pray that God would bring him back down and remind him to be humble. But then, Puritans (like many conservative/fundamental Christians today) believed that God's providence in blessing with material possessions and happiness showed his approval of their goodness and fitness for eternal life--so the cycle would begin again. In today's anachronistic terms, I'd call it *spiritual* bipolar disorder. As for Margaret Tyndal Winthrop, she didn't seem to chafe under the burden. She was devoted to her husband, well-respected in the community, and always expressed compassion and understanding. This is one of the things that worries me most about the Puritans - that loving the beauty of the world could somehow be seen as a sin. That if you had a happy and loving family, you ought to be punished, made to suffer. As you say, a kind of spiritual bipolar disorder. 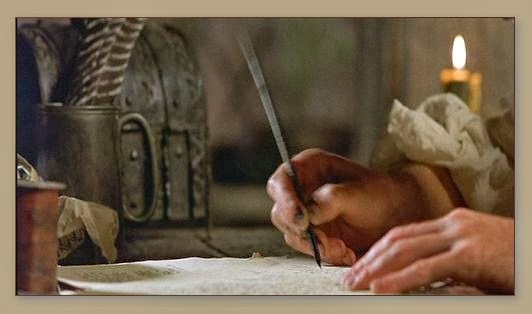 I've heard several people (not Puritans, but spiritual descendants of them, surely) say in the last decade that the second coming of Christ is imminent, and that we're living in the "anti-typical Day of Atonement," which is a sober time of reflections on one's many sins, and the time to perfect one's character before the judgment. Like the Calvinist Puritans, they believe that only people of the "Elect of God," who are predestined or who know the "Truth," will be saved. There is no understanding of grace, mercy, and forgiveness in that paradigm.